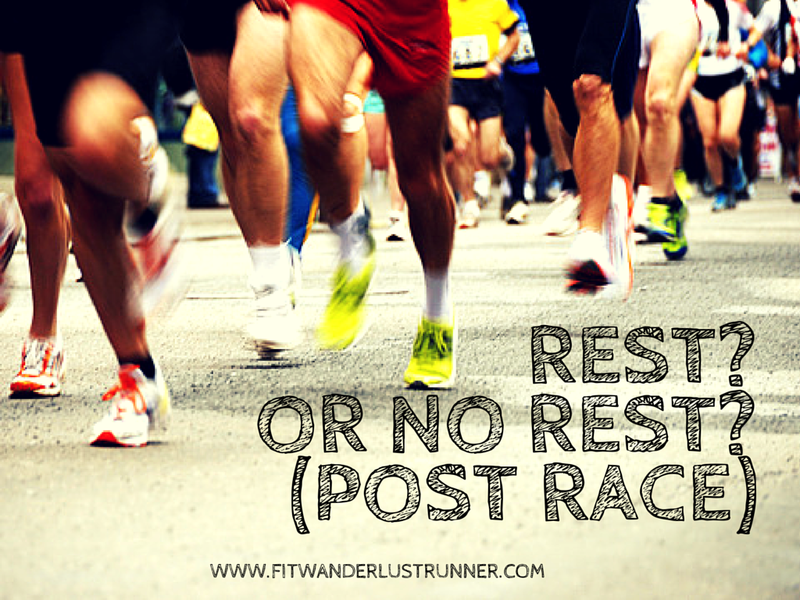 Fit Wanderlust Runner: Keep Running or Take Time Off After a Race?? My last race was almost two weeks ago. Since then I haven't gone on a single run. I've taken my dogs on walks but no running. I was a bit sore afterwards but it wasn't until this week that I started experiencing some knee pain. Maybe life was just trying to catch up with me since I have been so busy with moving. My husband also hasn't been running since the race. He was very sore and experienced knee pain immediately following the race, but is perfectly fine now. Funny how our recovery has been completely opposite. So this weekend will mark two weeks since our half marathon, but I can't help but think how much time should one really take off after a race? Or do you just keep running and bear the pain?? The one thing I have learned from running all these years is to really listen to your body. I know it is easier said than done but it is how I rationalize my recovery after each race. Each person recovers differently. Some people just take one day off and then continue on with their training for the next race. Some of the most common reactions after a race are lingering soreness, dehydration, and a general feeling of lethargy. I am not a doctor, but it makes perfect sense to not jump back into it until those symptoms are resolved. Like I said, each person is different so don't be discouraged if your recovery time is longer than your fellow running buddies. Some people are just light on their feet and bounce back quicker. What can I do to improve for next race? Was I properly fueling my body during training? Running can be very strenuous on your body. I can clearly remember my first marathon and how much recovery time I needed. I was completely dehydrated by the end of the race and every part of my body hurt. I needed a complete break. I took almost 6 weeks off and frankly my body probably needed two more weeks. But my second marathon, I only took 4 weeks off and felt rejuvenated and eager to start running again. So what's normal? I can't remember where I read this but I do know that some runners follow the rule of taking roughly a day off of running for every mile in the race. That might mean taking 21-28 days off with little or no running after a marathon or close to two weeks for a half marathon. This is kind of looked upon as a conservative approach. Taking that much time off allows for enough time to fully recover and can help eliminate ongoing soreness, avoid overuse injuries, and avoid trying to run through mental burnout. You’re still experiencing soreness or swelling from your race. You are having negative thoughts about running. Here is one of the drawbacks from following that method and taking so much time off: you may lose a lot of your hard earned fitness. In some ways, you may have to go back to square one before you start planning for your next race. If you recover quickly and take steps to promote recovery, it’s possible to take as few as seven to 14 days off and get right back into training for shorter distances. No more soreness or fatigue. You are eager to get started again. Your mental outlook is positive once again. So given the way I currently feel...I have just a few more days of rest before I start training for my next race. I can hardly wait! Moral of the story, always ALWAYS listen to your body! I think it's a good idea to take a little bit of time off after a long race. Something like a marathon is really pushing your body so it needs time to recover. I have been dealing with a lingering knee issue for almost a year now and when it first started, I definitely pushed myself too hard instead of giving my body time to rest. I wish I had listened to my body a little more back then. Listening to our bodies is so important! It's hard to do sometimes, though. I can get a little stubborn hehe.